And How Come Every Team Has a Fat Chick? With the Women’s College World Series currently unfolding, Uni Watch is brimming with questions about college softball. For example: How come some of the teams wear pants and others wear shorts? And how do the ones wearing shorts manage to slide without chewing up their legs? Some shorts-clad teams appear to deal with this by wearing knee pads, but why take the risk of having any exposed skin? Then there’s the matter of headwear. Let’s look at just one school, Tennessee, where the styles a few days ago ranged from orange headbands to white headbands to visors. Meanwhile, the coaches are wearing caps. Aren’t there any rules governing this? Someone who’s knowledgeable about this sport, please fill us all in. One question Uni Watch can readily answer: How cool are UCLA’s white-on-white stirrups? Answer: Very, very cool. Uni Watch News Ticker: Lots of encouraging NCAA stirrup action on the men’s side, including players for Cal State Fullerton, Oklahoma, and San Diego. Let’s hope these guys all get drafted and make it to the bigs. 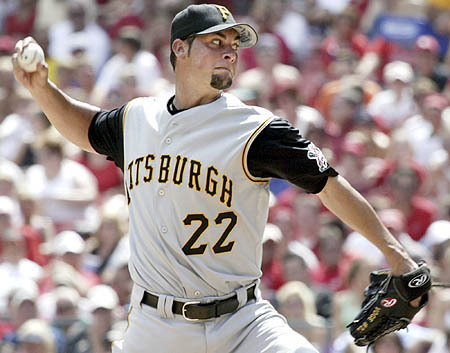 … Another MLB player with something (although it’s not clear what) written under his brim: Ryan Vogelsong. 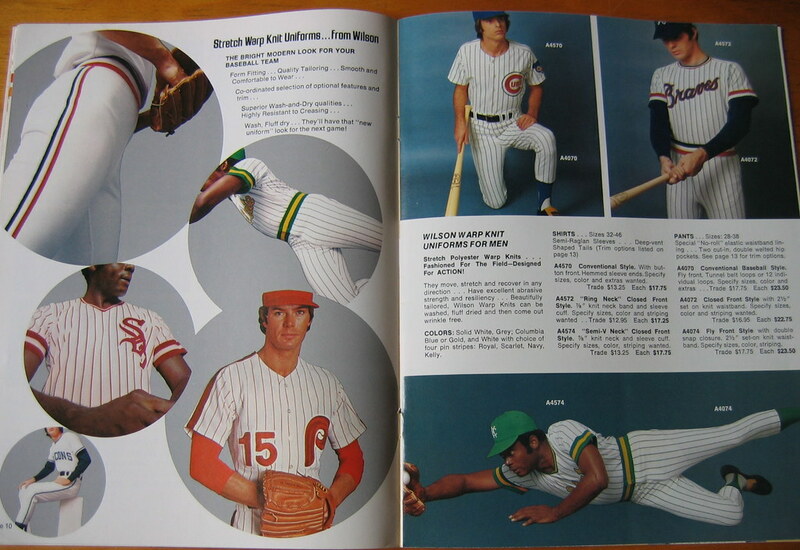 … Just scored another old uniform catalog on eBay. 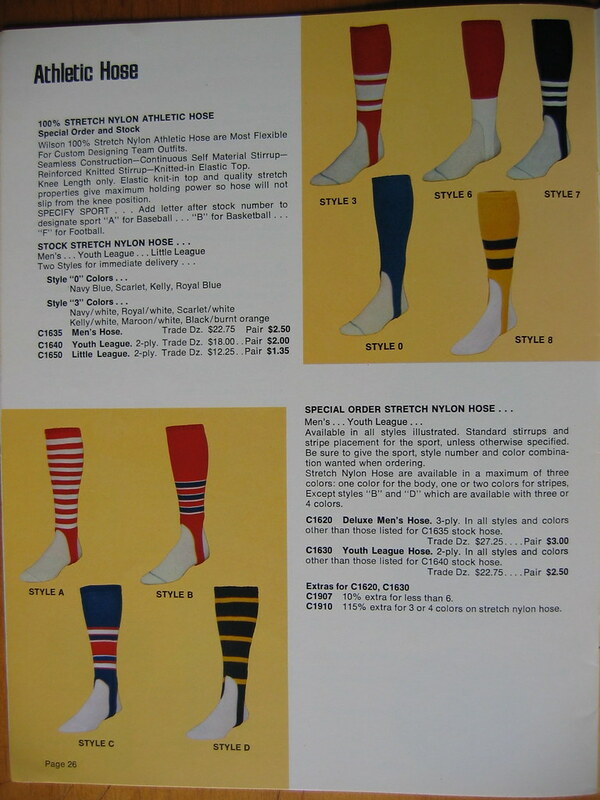 The early 1970s weren’t exactly a golden age, uni-wise, but the hosiery page totally rocks. … Bradley Viggs asks: “Most hockey players wear their names and/or numbers on thier glove cuffs. 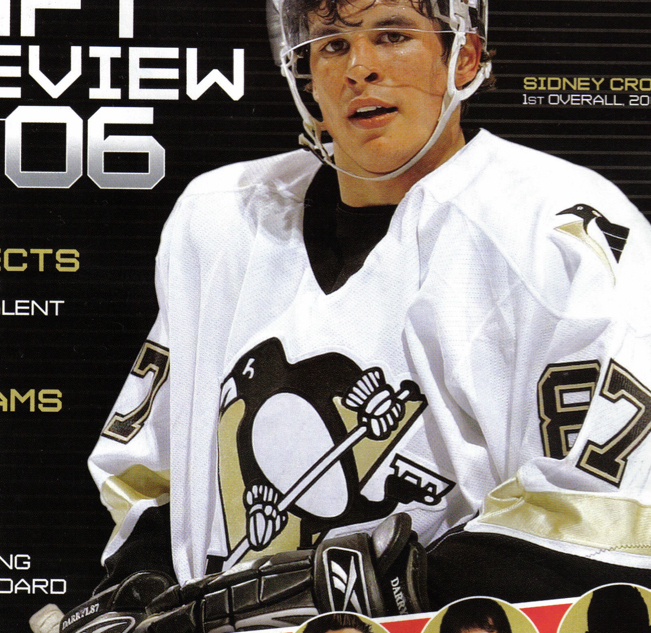 But while reading about the upcoming NHL draft, this photo of Sidney Crosby caught my eye. Instead of ‘Crosby87’ or ‘Sid’ on his glove cuff, he has ‘DARRYL87.’ Know of any reason why?” Yup: 87 is his uni number, and Crosby was nicknamed Darryl after scoring 8 points in his first exhibition game in juniors — a reference to Darryl Sittler, who once scored 10 points in an NHL game. … As predicted in this space yesterday, most MLB umpires wore a memorial tribute to Eric Gregg last night, in the form of a black sweatband, usually on the right arm. … Yesterday’s post about the Angels donning specs to salute Tampa skipper Joe Maddon prompted Bryan Redemske to point out that the St. Petersburg Times pulled a similar stunt with Maddon’s own team a few months back. … Interesting to see that the Lexington Legends, for whom Roger Clemens pitched yesterday, have a full-chest insignia but wear their uni numbers on the left side instead of the right, an uncommon style not seen in the bigs since the late-’90s Reds. … New ESPN column tomorrow — a World Cup preview, whoop-whoop. 40 comments to And How Come Every Team Has a Fat Chick? an interesting trend continued last night. the trend of current mlb’ers wearing their mlb number while on assignment in the minors. clemens wore 22 last night, while the lexington legends roster stated that eric cavers is assigned that jersey. does anyone know if their is any protocol when situations like this arise? The only thing i can fill in about softball is abou the short bearing teams. My friend’s sister who plays team wears shorts and underneath they wear sliding shorts. Which are similar to compression shorts with padding in them. Speaking of softball…How atrocious were the Oregon State unis during their game with Arizona? They were black on black on black with the front graphics in an odd slanted angle diminishing in size from left to right. Not only were the uniforms rife with logo creep, but the coaches were walking billboards. They looked like Under Armor University sponsored by the State of Oregon (Of course they did not use the team nickname during the game or on the unis because I guess it is quite a quandary to have a women’s team called the Beavers). I love the site and I love the links. Keep up the good work! You do not slide on your leg. You slide on your hip or rump. The third reference to stir-ups for men’s college baseball is the University of San Diego and not San Diego State (Tony Gwynn’s team). To make things more confusing there is also a UC-San Diego. The umps working NY-BOS last night were not wearing any black sweat/arm bands. The crew at the Mets/Dodgers game were – in fact, the HP ump,one supposes a more permanent band is on the way…. 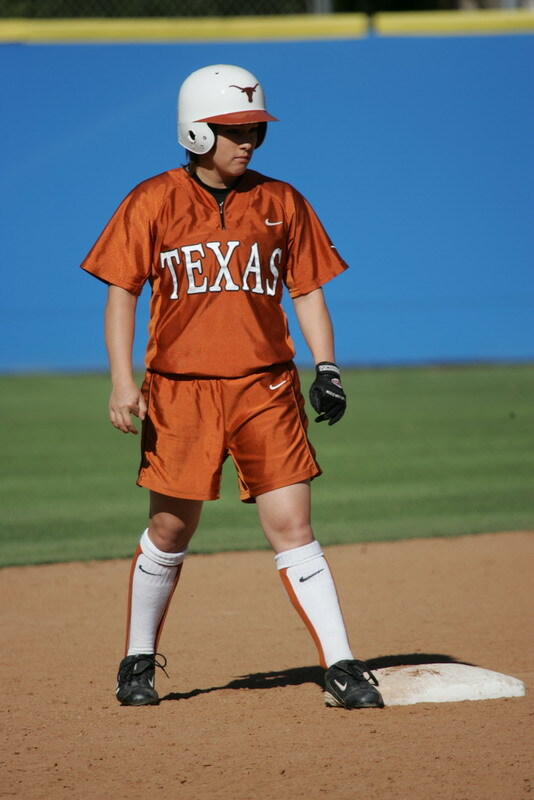 I think the Texas softball team uses both shorts and regular pants. When do they decide to use which set of uniforms? First of all, I totally disagree about UCLA’s white on white stirrups looking good. I have even seen them wear them with shorts in the past. Shudder. Doesn’t this go completely against Uni Watch’s standing objection to color on color coordination of uniforms (i.e. black on black pants and jerseys)? If not, it definitely should. Also, as for sliding, you do try to slide on your hip or rump, but the legs do get involved in some form or another. I would never want to slide unless I had to in shorts. After watching the Cubs-Astros and Twins-Mariners game I started thinking about chatchers chest protectors and how they’re very different from player to player. Joe Mauer has a shoulder flap on only one side, but Most catchers have them on both. I remember not that long ago where cathers didn’t even have a shoulder flap, and the ones who had it on only one side were rare. Going even further back to the days of Yogi Berra, why did the evolve from having the extension covering the family jewels to how they are today? If you want to talk fat just look at most of the OLs and some DLs in the NFL. Talk about huge bellies. Obviously doesn’t mean they aren’t athletes. Any reason why it seems OLs tend toward the big belly physique more than DLs? Or maybe it is just DEs who tend to be more cut. I think the white on white stirrups would look OK with more white in the uni. With dark shirt, dark pants and white on white stirrups it looks like the whole team pulled the wrong socks out of the drawer. In general I think softball unis have a long way to go to look good. Still waiting for the rugby column ;) A lot of teams have switched to a tight, cool base-like jersey that looks really weird to traditionalists like myself. Short-sleeves, fine. Tight jerseys that make ruggers look like bobsledders or cyclists, not good. Looking forward to the world cup column. Are you also going to explain some of the odd rules around jockey silks for the Belmont? 3-10-c. Headgear. Visors, headbands and caps are uniform accessories and may be mixed. All headgear must be of the same predominant color and worn as intended by the manufacturer. Plastic visors, bandannas and handkerchiefs are not allowable headgear even if covered or worn under a cap or helmet. Exception: The catcherÃ¢â‚¬â„¢s headgear may be of different color than other defenderÃ¢â‚¬â„¢s headgear. ***Also, the reference to an orange headband on the Tennessee player appears to be nothing more than orange pre-wrap. I’ve also seen this with some collegiate women’s basketball players — using a (near) team-color pre-wrap as a substitute for a full headband. All this talk about stirrups! I’ve looked online everywhere to find out who makes MLB authentic stirrups without any luck. Can anyone help? I agree with Paul that the UCLA white-on-white stirrups look pretty sweet, but I had only seen them with their all-white uniforms. The look decidedly less cool with the all-blue uniforms, but at least they’re still unique. According to reports out of Lexington, the catcher allowed Clemes to wear 22 for last night. A small gesture really, when you also consider Clemens paid for a complete re-decoration of the team’s clubhouse with new TVs and furniture. Simple answer. If every team did not have a fat chick, what need would there be for the wingman? Good stirrup selection available here. Sliding in shorts is not hard. I’ve played in both pants and shorts and prefer the shorts much more. We wear compression shorts underneath the baggier ones, and combine that with tall socks and/or a sliding pad (which rolls down when you aren’t batting/on base) you won’t hurt yourself. Unless you never learned how to slide properly, that is. Does anybody know if any MLB catchers use that Cool-Flo helmet under a mask while catching? Do they even make a flap less Cool-Flo helmet? Clemens did refurbish the clubhouse: “He refurbished the Legends’ clubhouse. (Roger Clemens, decorator. Who knew? )” from http://www.kentucky.com/mld/kentucky/sports/columnists/john_clay/14758001.htm . My high school softball team actually wears spandex, if you can imagine that. 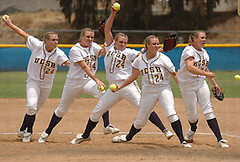 Shorts are quite common for girls fastpitch players, particularly on travel/club teams. Girls wear sliding shorts underneath and usually wear at least one knee pad. Girls tend to prefer shorts to pants, especially when the weather gets nicer. Catchers do *not* wear coolflo helmets, though Met catchers wear helmets with that gradient pattern on them, just like the batting helmets. Reason hockey players have their number and/or name applied to their gloves? So they can be returned to their owners in the event of a multi-party donnybrook. True story. Jill, you sound kind of cute. Use Jill’s link and manually throw a 5 on to the end. Agreed that it looks amateurish. Regarding the picture of the Oklahoma mens baseball team, the one thing that stood out at me was that the NOB of each jersey is horizontal and not arched. To the best of my knowledge, that hasn’t been seen on the Major League level since the A’s in ’86.